Published on September 13, 2011 in China, Finance, General T&T, International, Law, People's Partnership, Politics and Tourism. 70 Comments Tags: Caribbean, Kamla Persad-Bissessar, T&T Govt. 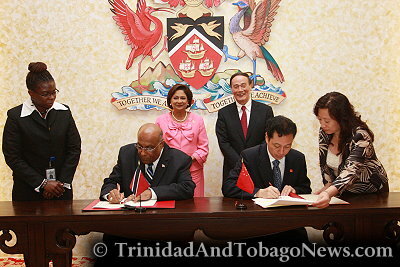 Trinidad and Tobago’s Prime Minister Kamla Persad-Bissessar (rear left) and Chinese Vice Premier Wang Qishan (rear right) attend a signing ceremony for an intergovernmental agreement between the two countries at the Diplomatic Centre in St. Ann’s Port of Spain, Trinidad and Tobago, on Monday, September 12, 2011. IN A BOLD declaration of his country’s bold ambitions for the Caribbean region, China’s Vice Premier Wang Qishan yesterday unveiled a suite of measures including a $6.3 billion loan to regional governments, aimed at deepening cooperation between the People’s Republic and the Caribbean. Published on May 16, 2011 in General T&T and Tourism. Closed Tags: Caribbean, Derren Joseph. Last week I had an interesting conversation with a final-year UWI student. She was doing research on music tourism. As we spoke, we wondered to what extent is music tourism similar to what we in the Caribbean context, loosely term as festival tourism.